Some employers provide a copy of their employee policy manuals to each of their employees. Others employers make copies available over the Internet or Intranet, or in central locations such as the employer’s human resources department, personnel department or headquarters. But whether or not you were provided a copy of your employer’s handbook, it can be important to understand the employer’s workplace practices and policies. 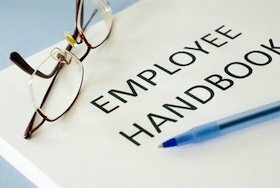 Depending on the circumstances, an employee handbook can be a binding employment contract. In fact, unless there is a prominent disclaimer clearly stating it is not a binding agreement, both New Jersey and New York courts typically will enforce an employee handbook as a contract. The employment relationship between the Company and its employees is employment-at-will. Any employee is free to end his or her employment with the Company at any time, for any reason, with or without notice. Likewise, the company may, at any time, decide end an individual’s employment with or without cause or prior notice. Neither this handbook nor any other verbal communication is a contract of employment. Only a written agreement executed by the Company’s President or Chief Executive Officer can alter the at-will relationship. Otherwise, the Company reserves the right to terminate an individual’s employment at any time for any reason. Unfortunately, unless you have a separate agreement that says otherwise, a clear and prominent disclaimer is likely to make your employer’s employee handbook unenforceable. Since employee handbooks can be legally binding contracts, it is important to understand the policies included in them. In many instances, it may be worth speaking to a New York or New Jersey employee handbook lawyer. Some employers try to include unpopular policies in their manuals to make it less likely employees will realize they have agreed to them. Two such provisions to watch out for are non-compete agreements and arbitration provisions. Some handbooks state that the company’s employees cannot work for a competitor for a period of time after they stop working at their current job. Since a non-compete agreement can be very harmful when you are looking for your next job, it is highly recommended that you talk to an employment lawyer if your company’s employee handbook includes language which attempts to limit your right to work for one of its competitors in the future. Likewise, some employee policy manuals include arbitration provisions that require you to waive your right to bring a lawsuit or have a jury trial if you are wrongfully discharged or another one of your employment law rights has been violated. Since jury trials are generally considered better for employees than arbitration, you should talk to an employment attorney if you are deciding whether to work for an employer that requires you to agree to arbitration as a condition of getting hired or keeping your job. For more information, please see our Blog article: Employer Prohibited from Enforcing Arbitration Policy in Employee Handbook. If you have any questions about your employee handbook, please feel free to contact us online or to call us at (973) 744-4000 to schedule a consultation with an experienced New Jersey employee handbook attorney.